Many thanks to White’s Chapel United Methodist Church for background and development of this series! Liam, my 3 year old son, came down the steps with a stepstool. He stopped at about the fourth step from the bottom, and put the stepstool down next to him. “Is it dangerous?” Liam replied. One of the things we try to teach young ones is cause and effect: that choices we make and actions we take have consequences. Sometimes, choices we make and actions we take have consequences beyond our intent. If you climb on a stepstool on a staircase, and trip and fall, then you have farther to fall. If you snack right before a meal, then you won’t be able to eat all of your dinner. If you don’t look both ways before you cross a street, then you could get hit by a car. If you don’t say please and thank you, then you will find others might not say please and thank you to you. But, of course, these lessons of cause and effect are not only for children; all of our lives work this way, too. We all live lives of choices, and all choices have consequences. Some we intend, some we do not. Our spiritual lives work this way, too. 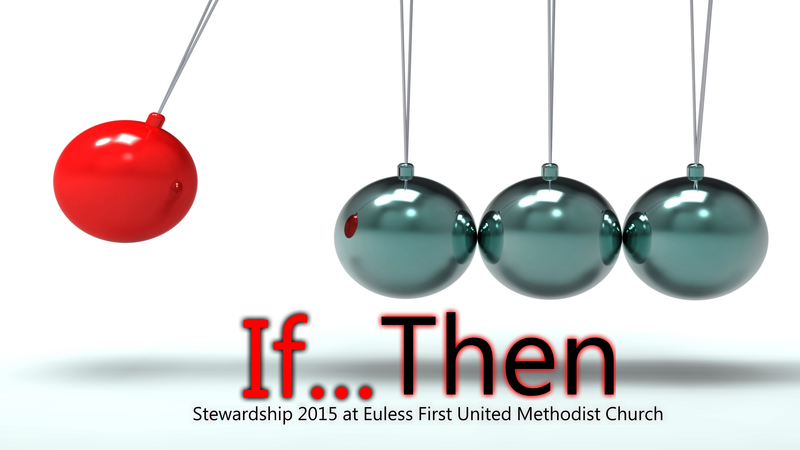 For the next 4 weeks we are going to focus on some of the basic “If..Then”s of the Christian life. Full Disclosure: this is also the beginning of our stewardship campaign. That means that over the next month or so we are going to invite you to consider your participation in and support of our congregation. As with any other organization, this church has bills to pay and financial commitments to keep. Let me say that differently: the ministry we do as a church needs our participation and our financial support. We make every effort to handle the money you contribute faithfully and our Finance Committee as well as our Board of Trustees are charged with assuring this. Our stewardship is not separable from our following Jesus. Our mission is following Jesus a bit better today than yesterday. Following Jesus takes all of us; we cannot follow Jesus halfway. Being disciples of Jesus means learning to follow him with all we are and all we have. We will observe a sacrament together this morning. We United Methodists consider there to be 2 sacraments: baptism and communion. Most Protestant denominations also recognize these 2. The Roman Catholic Church has 7 sacraments: baptism, confirmation, communion, penance, anointing of the sick, ordination and marriage. On the other end of the spectrum, the Salvation Army, which is actually a denomination of Christianity, has no sacraments,while anabaptists observe the 2 we observe and add footwashing. St. Francis of Assisi is said by some to have identified over a hundred sacraments. I say we are sacramental. Let me tell you why. Following John Wesley, and his method of following Jesus, we depend upon God and our community to support, uphold, and encourage us in this walk of faith. It takes strength and focus and ability beyond what any one of us can muster to follow Jesus. The regular, habitual practice of the sacraments is part of how we follow a couple millennia now of church history in finding strength outside ourselves to follow Jesus. All of which has me thinking that maybe we ought to spend a little time talking about “what is a sacrament?” One of the simplest definitions of a sacrament is that it is “an outward and physical sign of an inward and spiritual divine grace. This definition alone doesn’t satisfy me because we use that exact language referring to a wedding ring in the wedding liturgy, but we don’t recognize marriage as a sacrament. But I think it does carry the idea of a sacrament: that God is here and involved in some way more and different than God is everywhere and always active. Let’s spend a few moments on this: Communion, the sacrament we are going to share this morning, is a sign. It is a sign of God’s grace – in other words, of God’s good will toward us. Let that soak in. God has good will toward us! toward you! God wants good for you! Through this sacrament, we understand that God works invisibly. We don’t like invisibly these days. We think that is magic or spookiness or manipulation. Or maybe cgi. But think of it this way: God works in us, in this sacrament, in ways that can’t be seen – aren’t obvious. Sharing in the sacrament won’t make you stand taller or thinner or smile bigger or, really, even make you less hungry. But God does work in us through this sacrament. A sacrament quickens us. No, it doesn’t make is faster. “Quicken” is an old-fashioned way to say “bring to life.” Sharing communion brings us to life and strengthens and confirms our faith. The OT reading for the morning is a brief slice out of the bigger story of the beginning of Passover. You know the story, right? The Hebrew people were languishing in Egypt as slaves. Life was not good for them, and it was getting worse. They cried out to God. When people cry out to God, God hears, and God responds. You know this story even if you haven’t read it in Exodus – in the Bible. You’ve seen “The 10 Commandments,” or “The Prince of Egypt,” or some similar version of the story. God calls Moses to lead the deliverance of the slaves. Pharoah says ok, then changes his mind. So then we get plagues. 10 of them. But God has a plan to protect his own people – for the Angel of Death to “Pass Over” their houses and thus allow them all to live. God intends this great act on God’s part not just to be a one-off. You see, God has much grander designs here than merely freeing slaves. God is creating a people. While a single event doesn’t make a people, doesn’t bond a people and galvanize them to face incredible odds and horrific challenges. But a single event can form the basis for something that lasts. That’s what sacraments are about. Today, this act, this sacrament, takes us back nearly 2,000 years! The great thing about a sacrament is that it gives us this great opportunity to experience the presence of God, to come alive, to confirm and strengthen our faith. The challenge of a sacrament is that we not it into just another set of going through the motions or just another magic event. Sacraments run this risk for us. I remember years ago feeling like we offered communion too often. I thought people didn’t take it seriously; that it didn’t mean anything. I have since learned that such assumptions almost always say more about the person making them than they do about other people. When, or if, I assume something about you or your spiritual life, without actually knowing you, my assumptions say more about me than about you. I have since learned that for many people, this simple observance of the sacrament means more than I could possibly know – certainly more than my words can describe. This is because our celebration of this sacrament today connects us to Jesus’ celebration of it so long ago. It means that God’s grace is here, now, for us. We can also turn a sacrament into a magic formula. “this must happen every time exactly as it happened for me the first time!” we might say. Remember how Jacob, waking up from a dream, built a little monument and said, “Surely God was in this place and I didn’t know it!”? (Genesis 28) He didn’t stay there the rest of his life, but the experience he had there changed the rest of his life. The bible doesn’t tell us that Jacob went to sleep every night with a rock for a pillow just in case that “made” the dream happen, but I’m fairly sure that many mornings when Jacob woke up, he remembered that single, special time. Celebrating a sacrament means you can have a tangible experience of God’s grace – God’s good will toward you – this morning. If we are sacramental people. Every ‘if’ has a ‘then;’ often more than one. The ‘then’ for today’s ‘if’ is this: ‘we respond to God’s grace.’ To keep this clear, here is a concise summary of God’s good will toward us. to shine in them and through them in ways that draw other people, all people, toward God’s grace. You and I are invited today to respond to God’s grace. We are invited everyday to respond to God’s grace, but today we celebrate a sacrament together. And if we celebrate a sacrament together, then we ought to respond to God’s grace that is present here and now. How will you respond to God’s grace? God loves you because it is God’s character and decision to love you. You didn’t have to earn it, so you can’t un-earn it. God’s intent, through his grace, is to create a people through whom he can reach, and save, the world. God wants all of you – every aspect of your life. I invite you to further consider how you will respond to God’s grace during our celebration of the sacrament together.